This is the first in a series of 3 formatives aimed at explaining/introducing the NGSS Science and Engineering Practices to students. The goal is to make students aware of what they are, when they are using them in class and why. Once students have gone through the series, and to promote metacognition, I have them write a weekly reflection where they identify the practice that helped them most in our class that particular week. Science begins with a question about a phenomenon such as “Why is the sky blue?” or “What causes cancer?” A basic practice of the scientist is the ability to formulate empirically answerable questions about phenomena to establish what is already known, and to determine what questions have yet to be satisfactorily answered. Use the flowchart above to determine if the following questions are testable or not. To check your answers, click on the blue checkmark (bottom right). 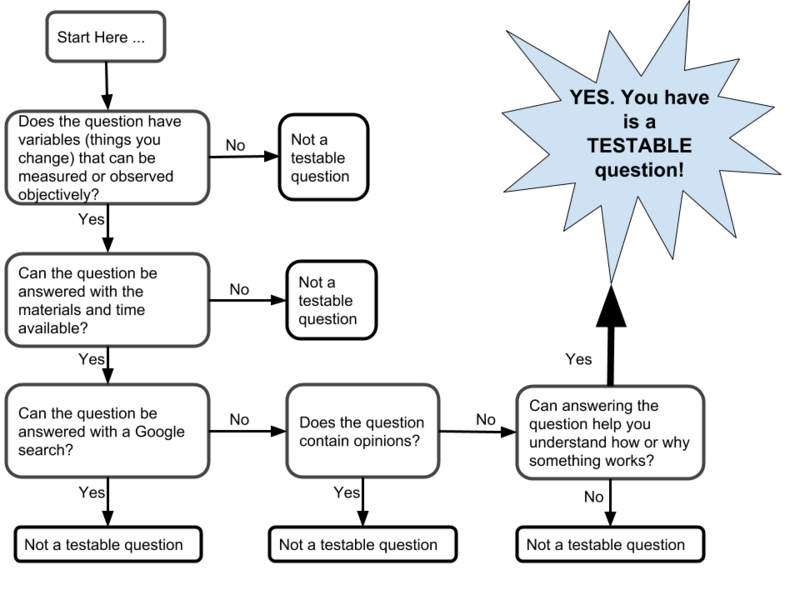 Choose one of the non-testable questions and explain why it cannot be tested. Then transform it into a testable question. Science often involves the construction and use of models and simulations to help develop explanations about natural phenomena. Models make it possible to go beyond things you observe and simulate a world not yet seen. Models enable predictions of the form “if…then… therefore” to be made in order to test hypothetical explanations. A scientific model can represent objects AND processes. A model can represent how muscles move. What would be the benefit of building a model of the solar system? A model is small enough to work with. Which of the following can be used as scientific models? What are some of the limitations of using models in science? Models give us a picture of the real thing.